You'll never guess what's in these cupcakes! I wanted to give you a good appetizer cupcake. 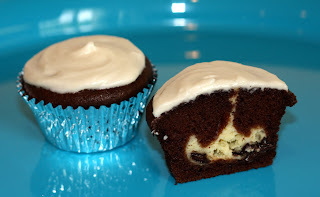 I came up with the idea of little one bite sandwiches masquerading as cupcakes. I'll explain how I made mine, but there are a thousand different variations you could come up with by changing the bread and the contents. What I love about these is how simple they are, but still SO yummy. When I gave Squirrel one to try, she inspected it, then leaned over and started licking the frosting off. Once she got a taste she inhaled the rest of it. It was pretty funny. 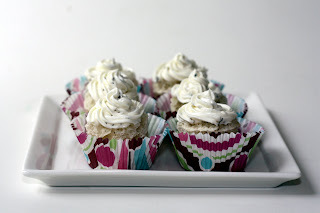 You will have to visit her blog to see exactly what's in these cupcakes, plus some adorable photos of one being devoured. The blackbottom cupcakes look amazing.